KOCHI: Keralakaumudi Deputy Editor P.P. James (feature) and Keralakaumudi Illustrator C.V. Dwijith (cartoon) have been selected for the India Press Club of North America (IPCNA) Award. The award carries a purse of Rs. 25,000 and a plaque. 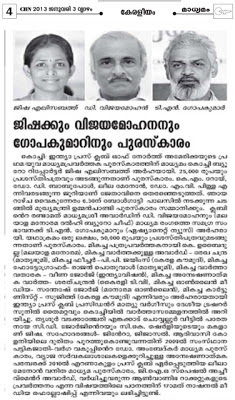 The Madhyamashree Award which carries one lakh rupees went to D. Vijayamohan of Malayala Manorama. Outstanding Contribution to current Journalism award which carries Rs. 50000 goes to T.N. Gopakumar of Asianet News. 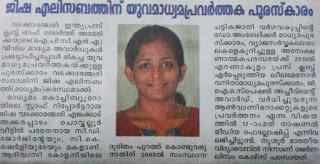 Other awards: Best Journalist: K. Ubaidulla (Malayala Manorama), Best Reporter: Rekha Chandra (Mathrubhumi), Photographer: Rajan Pothuval (Mathrubhumi), News Reader: Veena George (Indiavision), Investigative News: Sarath Chandran (Kairali TV), Oneline Media: Santhosh George (Malayala Manorama), and Young Journalist: Jisha Elizabeth (Madhyamam). The jury comprised K.M. Roy, Dr. Sebastian Paul, Leela Menon and Dr. M.V. Pillai. The awards will be presented by Chief Minister Oommen Chandy at a function at Bolgatty Palace in Kochi at 6.30 pm on January 6. Kochi: D.Vijayamohan, Bureau Chief of Malayala Manorama in New Delhi, has won the Madhyamasree Award, instituted by the India Press Club of North America (IPCNA). The award, carrying a cash prize of Rs one lakh, will be given away by Chief Minister Oommen Chandy at Bolghatty Palace at 6.30 pm. Thursday. 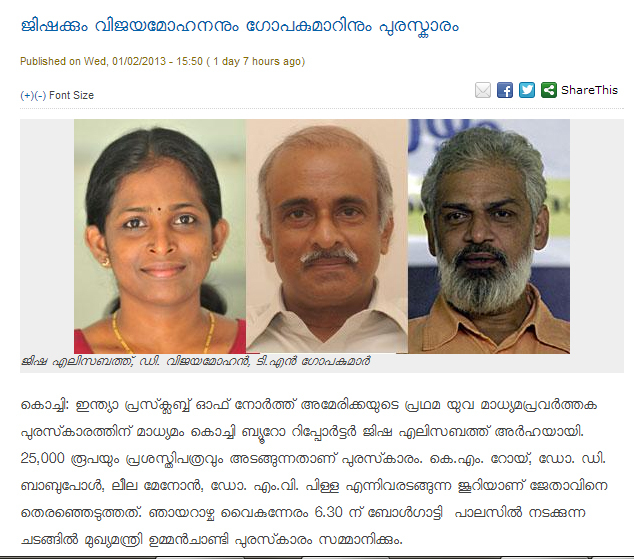 The IPCNA award (Rs 50000) for overall contribution will be given to T.N.Gopakumar, News Editor of Asianet channel. 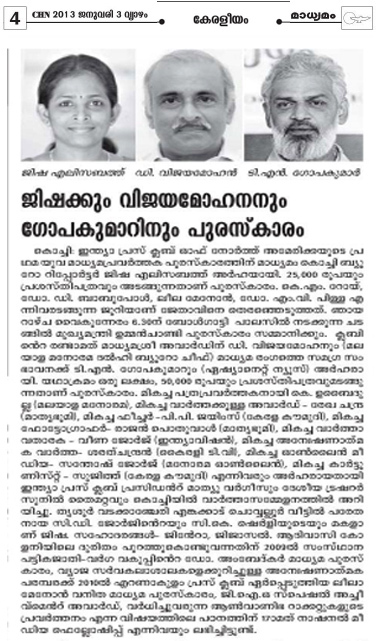 K.Obeidulla, Director, Malayala Manorama Editorial Training and Research has won the award for best journalistic activities (Rs 25000), informed Mathew Verghese, IPCNA President and Sunil Thaimattam, IPCNA Treasurer. From renowned senior journalist Thomas Jacob. Congratz Jisha. Keep up the great Journalistic work. അവാര്‍ഡ്‌ ജേതാക്കളായ ഇരുത്തം വന്ന തല നരച്ച സീനിയര്‍ പത്ര പ്രവര്‍ത്തകരുടെ ഫോട്ടോയുടെ ഇടയില്‍ ജിഷയെന്ന യുവ പത്ര പ്രവര്‍ത്തകയുടെ ഫോട്ടോ കണ്ടപ്പോള്‍ വളരെ സന്തോഷം തോന്നുന്നു. ഇനിയും അനേകം അവാര്‍ഡുകള്‍ തേടി എത്തട്ടെ എന്ന പ്രാര്‍ത്ഥനയോടെ ആല്‍മാര്‍ത്തമായ അഭിനന്ദനങ്ങള്‍.